I read this article and found it very interesting, thought it might be something for you. The article is called Child-Health Spending Soars, But 40 Million Indian Children Stunted and is located at https://archive.indiaspend.com/cover-story/child-health-spending-soars-but-40-million-indian-children-stunted-47499. 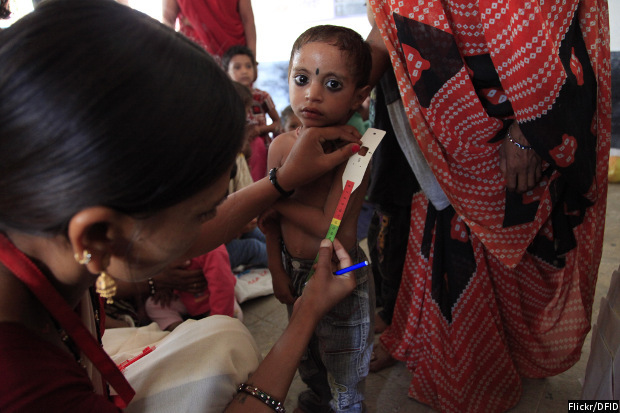 Here are some health statistics for Indian children five years or younger: 38.7% are stunted (below normal height for the age), 19.8% are wasted (underweight and short) and 42.4% are underweight. While child-undernourishment rates have declined, India still remains home to more than 40 million stunted children under five, more than any country, IndiaSpend reported, based on the India Health Report for Nutrition Security in India, 2015, released earlier this month by the Public Health Foundation of India (PHFI). The PHFI study examines child-undernourishment data from the recent Rapid Survey on Children (RSoC) to study the impact of public spending on health. The study also analysis cultural practices, lack of drinking water and sanitation facilities and poverty. India is a young country with a median population of 25 years but poor health can set back economic progress, as Nobel laureate Amartya Sen noted. The central government’s spending on health has been changing structurally over the past two decades, from providing only nutritional supplements, such as vitamins, to a more holistic approach, from maternal health to sanitation. There was no significant change in the health expenditure for children by the government between 2001-02 and 2004-05; it ranged from 0.28% to 0.31% of the total expenditure of the government, and between 2.06% and 2.5 % of gross domestic product (GDP), according to a joint study by United Nations’ Child Relief Fund (UNICEF) and Centre for Budget and Government Accountability (CBGA), a New-Delhi-based think tank. In 2005-06, the allocation for child development was increased to 0.56% of the total expenditure (4.17% of GDP). The increase was due to the focus on meeting the challenges of United Nation’s Millennium Development Goals (MDGs). IndiaSpend reported how India missed MDG targets, despite the Integrated Child Development Scheme (ICDS, a flagship programme of the central government since 1975 and one of the world’s largest for child-care and development: As many as 82.9 million children up to six years of age benefitted over 40 years. The ICDS was the only scheme focused on child health and overall development for about three decades, until the National Rural Health Mission (NRHM) was launched in 2005. NRHM was upgraded to the National Health Mission (NHM) in 2013, to provide accessible, affordable and quality healthcare to rural areas, especially vulnerable groups, with a sub-mission known as Reproductive and Child Health (RCH). With the focus on health and nutrition, money set aside for child health increased more than three times over a decade to 2014-15, according to Lok Sabha data. Globally India is still home to 17.5% of population, accounts for 20% of the global burden of disease, 27% of neonatal deaths and 21% of all child deaths (younger than five years), according to a report in Mint based on research findings from the Lancet journal of health. “India remains committed to the critical issue, and stands ready to work with all stakeholders to eradicate malnutrition”, Minister of Health and Family Welfare JP Nadda said during the release of the PHFI report. Local acceleration of health policies is very important to improve nutrition, said the report, citing data on differences between states in stunted, wasted or underweight children. Some of the states with the highest proportion of underweight children, such as Jharkhand with 42% and Bihar with 37%, are more than or equal to low-income countries like Timor Leste (45%) and Niger (37%). Similarly, Kerala with 19% and Goa with 21%–both states have India’s healthiest children–are comparable to middle-income countries such as Maldives with 19% and Belize with 22%. Under the devolution recommendations of the 14th Finance Commission, the states’ share of divisible tax revenue has increased to 42% from 32%. But this has led to a decline in funds allocated by the Centre for social welfare schemes, impacting health and education spending. In theory, states should use the money so devolved for specific needs. “But how do we know that states are responsible enough to make judicious use of the additional funds?” NITI Aayog member Bibek Debroy wrote recently in the Indian Express. This is the first of a three-part series. You can read the second part here and the third part here.